come up with one. It took a few tries because honey always contributes a lot more moisture then sugar. My AI, teaching assistant, Shayenne was so patient - each time we had to redo it. But this final version is delicious. My husband (Chef) thinks I should add honey powder to pump up the honey flavor but for now I think we will stick with this recipe. The honey flavor is there, trust me. All this led me to think that blog post on honey madeleines would be a great idea. After all, once you have invested in a madeleine pan, it's nice to have a collection of madeleine recipes. I offer two recipes for madeleines in my Craftsy class French Miniature Desserts and they are good but I will try to more offer more madeleine recipes on the blog. I know plenty of you have those madeleine pans resting in your cupboards. Let's use them and make some beautiful madeleines. The thing is, Madeleine pans are rather exclusive, basically the only thing you can make in them are madeleines. time for bakers - we are moving out of citrus and the berries are not quite here yet. So honey is a nice flavor to explore this time of year. A good supermarket clover honey will work fine. But if you have some flavored honeys use them. Lavender honey could be really interesting in these. The batter is loose so be careful when you fill your piping bag. Maybe put down a piece of parchment paper to catch drips. Brush the shells of the madeleine pans with melted butter or spray with pan spray. Sift the flour over the pan – be generous, then tap out the excess. 1. Preheat the oven to 375 degrees, 190 Celsius, Gas Mark 5. 2. Sift together cake flour, baking powder and salt. Set aside. 3. Combine the honey and melted butter in a medium sized bowl. 4. 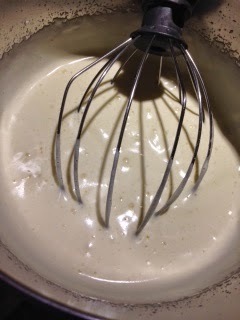 In a mixer fitted with the whisk attachment or a hand held mixer, combine the eggs and sugar. With the mixer at high speed, beat until the mixture is tripled in volume. This will take 8-10 minutes of mixing at high speed. 5. Using a spatula fold in 1/3rd of the egg mixture into the melted butter and honey. Then add this back into the egg mixture, fold gently. 6. 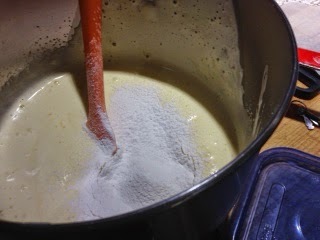 Sift the dry ingredients over egg mixture, in two increments. 7. Do not over mix. 9. Pipe the batter into the shells – slightly below the top of the pan. 10.Chill for 20 minutes in the refrigerator. 11.Bake at 375 degrees for 12 minutes. 12.At 12 minutes, test for doneness by inserting a skewer in the center – it should come out clean. 13. If the madeleines do not test clean, return them to the oven for 3-4 more minutes. 14. 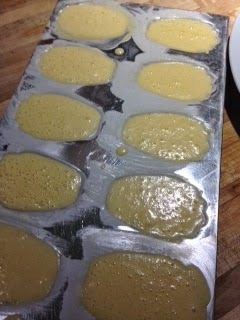 Let cool in the pan for about 5 minutes, then carefully remove the madeleines and move them to a cooling rack. 1. Combine the melted butter and honey. 2. 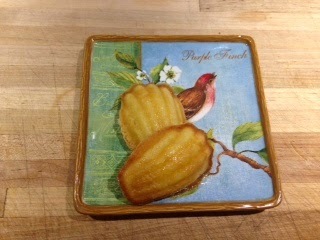 Brush on madeleines while still warm. The madeleines can be piped, wrapped and frozen for up to one month. Bake them from the frozen state and allow additional 10-12 minutes for baking. The madeleines are best eaten the day they are made. They will keep well wrapped and frozen, after baking for up to one month. Thaw at room temperature for several hours at room temperature. ***Thank you Carol for proofreading this recipe. We need your eagle eye as I type way too fast.